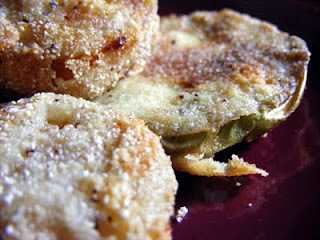 When the Summer's bounty of tomatoes starts to wain it is time for fried green tomatoes!! I like fried green tomatoes with just a hint of pink because they are not so tart and have a fuller flavor in my opinion. This is What's Cookin on Beaty's Creek today. Mix egg and milk together. Now sift flour, cornmeal, salt and pepper together. Dip tomatoes into milk mixture and then into cornmeal mixture. Pour a 1/4 inch of oil into a skillet and heat over medium heat until a bit of flour sizzles. Now place tomatoes in a single layer in your oil. Fry on each side for 4 minutes or until golden brown. Drain cooked tomatoes on paper towels. We like ours with ketchup (so wrong but taste so right) but plain they are great too! Yum! I'd be making these tonight if my tomatoes hadn't fizzled on the vine. Thanks for sharing!